Vienna tours by bike. 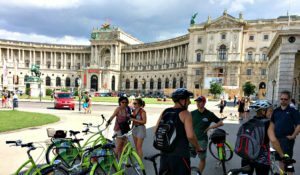 This three-hour morning bike tour covers all of Vienna’s classic landmarks in the city and on Ringstrasse state boulevard. It is the most popular bike tour in Vienna. You will also cycle right into the city centre to Stephansdom (St. Stephen’s Cathedral). My favourite sites there are the city squares like Am Hof and Judenplatz. Am Hof is often busy with seasonal markets. Judenplatz is a hidden square that hosts a vast Holocaust memorial, the Jewish Museum and a wonderful baroque town palace. The tour guides make frequent stops to provide stories and let you take photographs. 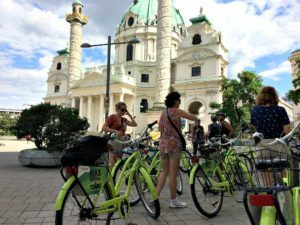 Learn more about the Vienna city bike tour (morning tour). Vienna tours by bike. 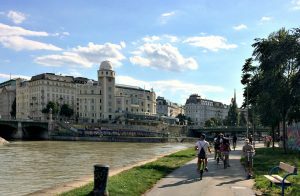 The afternoon bike tour covers all the classical sights along the Ringstrasse, while also venturing beyond the city centre to fabulous nearby attractions, such as the Vienna Prater, the Giant Ferris Wheel and the Danube Canal. 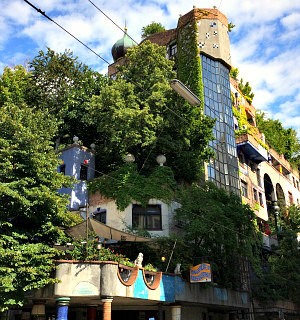 I love the fact that the tour includes Hundertwasserhaus (photo), which is hard to reach by public transport. I have joined that tour and recommend it to all friends who’d like to add something different to their classic city break. Read my Vienna bike tour review to find out more. Vienna tours by bike. Austrian food is heavy. It’s easy to let Schnitzel, Knodel, Wuerstel and Torten weigh you down. That is why I like the idea of a food tour by kickbike, like this one. 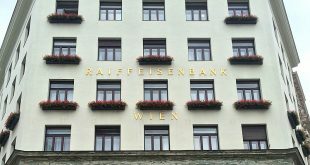 While roaming Vienna’s historic center between Museumsquartier and the Danube Canal you’ll learn about Wien and its food bit by bit. 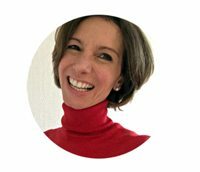 But it’s more than that: the tour guide is an easy going local who loves to have a conversation about local life style and contemporary Vienna. 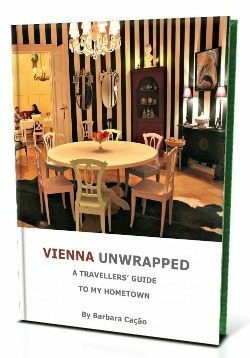 Definitely a tour for those who want to delve into authentic Wien. Find out more about the tour. Vienna tours by bike. If I could I would take you on this eBike tour along a really beautiful stretch of the Vienna Woods and Danube Island. 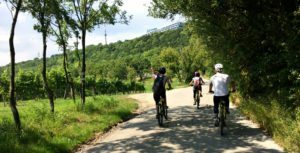 You’ll cycle along the Danube bike path to Nussdorf winery village, and follow the small roads along vineyards. Being moderately sporty, I did a very similar Vienna bicycle tour (currently unavailable) and loved to ride up the hills as if they were flat plains. From the top of Kahlenberg mountain, you can see all across the Danube, the Danube Island and Vienna. By the way, this is perhaps the only guided tour that takes you to Danube Island. What I love about this experience is that it blends a green Vienna experience with wine at a local vintner. Check availabilities and price. Cycle on the marked bike paths as much as you can. Some bike paths are shared with pedestrians. Watch out for corresponding signage. Use a bike helmet. Most bike tour operators provide them, especially for children. Beware of tramways when you cycle in the city. When you cross a tramway track, turn your wheels at least in a 45 degrees angle to the rail track so you don’t get stuck. No cycling in pedestrian areas. I remember police don’t take a joke on this when they are around. Never leave your bike unattended and unlocked. My tips: There are not many group bike tours in town. Therefore, Vienna tours by bike sell out quickly between June and September. Make sure you book well in advance. 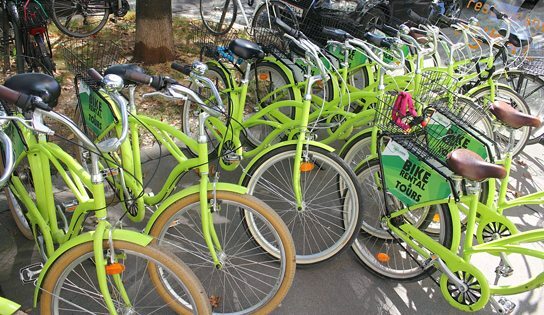 If you visit the city outside the period April to October consider renting a bike and doing a self-guided tour.